Celebrate George Harrison's 75th Birthday at The Beatles Story. Beatles Radio: The Beatles, Solos, Covers, Birthdays, News The Fab 4 and More! My Sweet Lord! ‘The Quiet Beatle’ George Harrison would have turned 75 this week. He will be joined by Thomas McConnell, a Liverpool-based singer songwriter, who will provide musical demonstration throughout the session. Tom is signed to Deltasonic Records and is currently touring his new album with his band, TV ME. 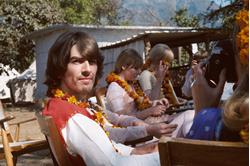 He played at the Philharmonic Hall in June last year as part of the concert George Harrison: The Beatles and Indian Music. The event is free and will be held in the Fab4 café.